Do you have a broken bolt or screw that you need to remove? Are you trying to hang a painting, repair a vehicle or lawnmower engine, or complete a do-it-yourself project in your home and you need to create or repair threads? If these are issues that you face, you will need to learn how to use a tap and die set. While the concept may seem overwhelming at first, especially if you are not particularly good with your hands, it is a skill that can easily be acquired with a bit of patience and lots of practice. First, you must know what these tools do, and the difference between the two. 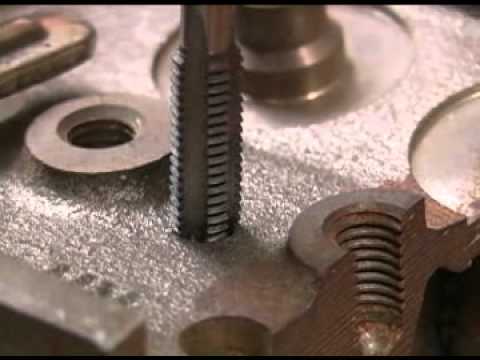 Taps are tools that create threads within a material, and dies are tools that create threads on the outside of a material. Taps and dies may seem complicated to work with at first, but they are not as complex as they appear to be. After all, I, too, was green when I first bought my set, but it was quite simple for me to learn how to work with it on my own. It is so very important to have this knowledge because you never know when you may need to create threads. For example, you may be fixing a plumbing leak and need to make a new pipe, or you may be building your son and daughter a tree house and you accidentally strip a couple of bolts. In nerve-wracking times like these, a working knowledge of tap and die sets can come in handy! It is always important that you have all your materials ready and available in advance. This will ensure that the process goes smoothly and you won’t have to stop and search for a critical component in the middle of working. It is always best to have everything prepared and in front of you ahead of time when you are starting any type of project that requires a wealth of materials. You may have thought that all you needed was a good tap and die set, but you will actually need additional materials in order to properly cut threads on the inside and outside of a given object. Most kits will come with a standard guide that will help you with this step. Follow the charts to see what is required. Insert the intended material into your vice or clamp. Once the material is in a position where it can no longer move or slip, you are ready. When you begin to drilling the hole for your tap, start at as slow a speed as possible. Always apply cutting oil on harder surfaces to soften them up appropriately. Insert the tap and use the ratchet to slowly turn the tool. Turn the tap completely around in a clockwise manner two times, then backtrack half a turn. This method prevents broken material from damaging the inside of your new thread while you work. Apply cutting oil as needed. You can easily figure this out if your dies are arranged in the correct order. Just take the one that looks the most appropriate, and see if it fits. If it does not, then try a size larger or a size smaller until you get the right one. Again, snugly fasten your intended-to-be-cut material using the vice. Be sure the end of the rod that you intend to thread is square. Apply some cutting oil and place the die over the material. Turn the wrench clockwise, and like the tap, make two full turns with a half a turn backwards. I hope you enjoyed this easy tutorial on how to use a tap and die set. Please be sure to follow each step I outlined for your best results, even if they seem time-consuming. You may think a step or process is unnecessary to the job you are doing, however I have found that everything that I listed is extremely important when it comes to the end result. Remember, taking a shortcut can result in a job that does not go as planned, wasting materials and your valuable time. You may also sustain an injury in the course of your work if you skip a crucial phase. It is best to follow all instructions as they are provided. If you enjoyed this article, please pass it along to your friends and family and share it on social media! Also, please let me know what you think by submitting a comment below!